It's time to check out Sea of Thieves again. Along with a big ol' shark to fight, the game's first big content update provides players with more ship-to-ship communication options like a speaking trumpet, pirate cosmetics like tattoos and scars, affordable (!) new ship gear, and some freshly-sewn clothing. The Hungering Deep is here at last. 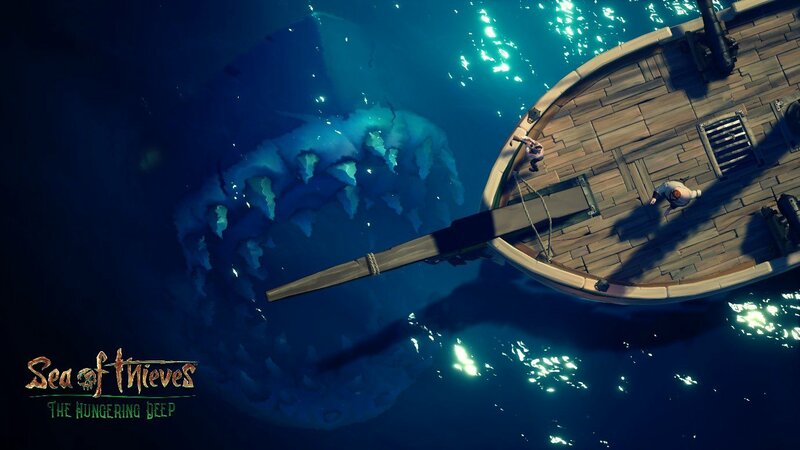 If you're at work or otherwise can't play Sea of Thieves right now and you're dying to see what the Megalodon looks like, here's a nice photo from reddit user MeshiiMitch and another from Spektronaut. Half the fun of the encounter will be figuring out how to summon the creature on your own, so I'll leave you to it. Needless to say, your crew will need to make use of the newly-added drum.